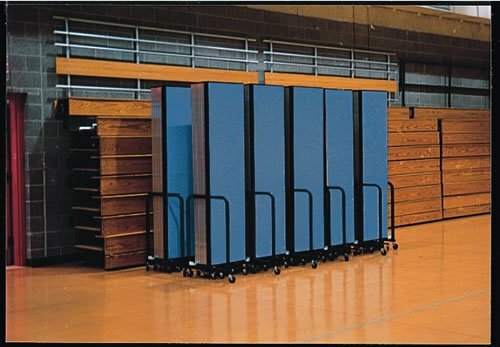 Uses: Education, Gymnasium, Schools Colors: Blue Lengths: 13 panel 24'-1" Heights: 7'-4"
240 linear feet of Portable Room Dividers store in only 50 sq. ft.!! Schools are often plagued with needing more classrooms and not having enough storage. How can you solve both problems in one? By using Screenflex Portable Room Dividers. The portable walls can be rolled into any room, office or hallway to create a much needed classroom. Or the dividers can be used as a separation in a classroom to hide sports equipment, science lab materials, student artwork, or whatever the case may be. Not only are room dividers easy to use, they are easy to store out of the way until needed. For instance over 240 linear feet of Portable Room Dividers store in only 50 sq. ft.! !